In the big picture, the Roadrunners have closed out a majestic calendar year, one that involved the team’s first-ever playoff appearance, a plethora of player graduations to the NHL level, and to put it simply -- fantastic hockey. The numbers will most certainly back-up the latter. The team finished 2018 with a 43-20-6-1 record (.664 %), earning points in 50 of 70 games played. But here, we go week-by-week, and for the Roadrunners during the last seven-day stretch, they split a two-game set with the Stockton Heat, winning by a 5-2 count on Friday night and falling by a 3-2 score on Saturday. Welcome back! Jens Looke and David Ullstrom returned to live action after each missed notable time due to injury. Looke scored his sixth goal of the season in his return Friday, matching his 59-game rookie total from the 2017-18 campaign. Welcome! Forward Giovanni Fiore made his team debut on Friday and totaled five shots on goal and a +/- rating of plus-one during the weekend. Laurent Dauphin’s dripping-with-skill shorthanded goal highlighted Friday’s win, his man-down tally with 9:47 to play in regulation eventually serving as the game-winner. The Roadrunners were the second-to-last team in the AHL to register a goal on the penalty kill this season. 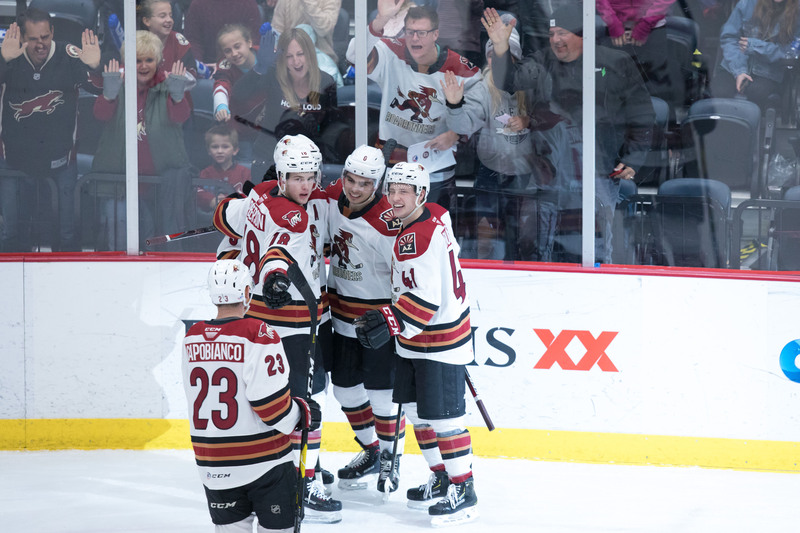 Despite outshooting the Heat 41-20 on Saturday, the Roadrunners fell short on the scoreboard, suffering their first regulation loss of the season when holding a lead entering the third period. They were 9-0-1-1 in such situations prior. Nick Merkley extended his point streak to four games over the weekend, registering three (1G, 2A), and now has a total of six (2G, 4A) in seven games since returning to the lineup. Also with three points during the weekend, Kyle Capobianco, who added a trio of assists to up his team-leading point total to 25 (4G, 21), the fourth highest amount among AHL defensemen. Conor Garland registered his first NHL assist on Thursday night against the Los Angeles Kings at STAPLES Center, credited with the secondary helper on Jakob Chychrun’s first period goal. 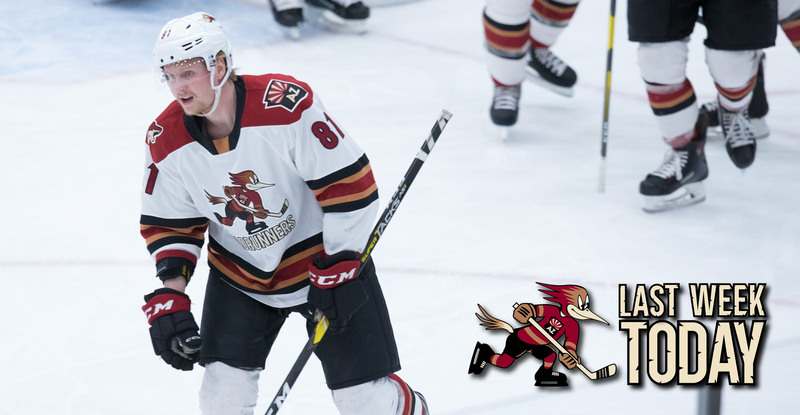 Garland tacked on another assist Saturday night against the Anaheim Ducks at Honda Center, helping to set up another former Roadrunner, Christian Fischer, score his ninth goal of the campaign – the second highest total among Arizona Coyotes players this season. Careful - it's hot! Defensemen Kyle Capobianco and Jordan Gross put on a rather impressive hande-eye coordination clinic during warm-ups prior to Friday night's game at Tucson Arena.